I was a fussy child. I did not like bones with my chicken. This presented a problem. For a family of six on a budget, boneless chicken breasts were rarely an option. Chicken was typically served in pieces, bone-in, Shake ‘n Bake style. After all, we were growing up in the heart of suburban Long Island. I must admit, it was not my favorite meal. I would push the meat around the plate and whine a bit. It was not exactly what you’d describe as quality time at the dinner table. Mind you, I didn’t dislike chicken – far from it. I longed for those Sunday dinners when my mother would roast a whole chicken, and I could eat the thinly carved breast slices that my dad would fan across the platter. Even then, suburban ingenuity defined the meal. A pop-up button, inserted into the breast of the “Oven Stuffer Roaster” would signal that the bird was done. If we were lucky, there would be bread stuffing as well, usually made with Pepperidge Farm bread crumbs. As an adult, I clung vehemently to my independence, and my ability to eat boneless chicken breasts no matter the cost. It didn’t matter if the rent money was tight, I would spend the extra cash for boneless chicken breasts. It was only long after when I started classes at the French Culinary Institute in 2005 did I learn that roasting a whole chicken was considered an epicurean art form. For some reason, I always found the idea of preparing a roast chicken intimidating. It was our instructor, Chef Candy – in her practical and authoritative way – who got me to relax about roasting. Even the FCI’s signature chicken recipe, Poulet Roti Grand-mere or “Grandmother’s Roast Chicken” inspired thoughts of a simpler life of sensual pleasure. Chef Candy carefully walked us through each step: removing the wishbone, trimming the wings, and trussing the bird so that the breast is plump and cooks evenly. We learned how to trim the leg bone, French style, and cut the breast on a bias. Maybe it is the dark days of February that demand some homespun warmth, or the somewhat disconcerting feeling that the wonderful, exhilarating time spent learning at the French Culinary Institute is now three years past. Whatever the reason, I have become obsessed with thoughts of trussing and roasting a chicken. I consult Alice Water’s “The Art of Simple Food,” and the technique could not be more poetic – one chicken, about four pounds, seasoned with salt and pepper. 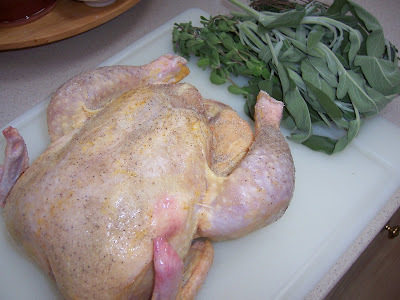 Stuffing the cavity of the bird with bundles of fresh thyme, sage and marjoram perfumes the meat. Waters recommends, if possible, that you season the bird a day or two ahead and refrigerate allowing the salt and pepper to penetrate the meat. My trussing skills are rusty and several times, the twine slithers from my hands. But, eventually, perseverance pays off and I wrestle the roaster into submission. It is tied into a taut, tidy package and placed in the refrigerator. On the afternoon of roasting, the chicken must sit out for about an hour before cooking. A chilled bird will not roast evenly. The oven is a searing 400 degrees. The directions are elementary – roast 20 minutes with breast side up, 20 minutes breast side down, and finish roasting 20 minutes up. The oven sizzles with anticipation, and the chicken breast acquires a lustrous, golden hue. That hot, buttery aroma – so beloved by Julia and now dressed with sprightly herbs – permeates my kitchen. My carving skills have endured the years and the tender, luscious meat peels from the frame. I French the bone and arrange several pieces on the plate, topped by an amber reduction prepared from pan drippings deglazed with white wine and chicken stock. Make no bones about it. Accompanied with a glass of white Bordeaux, the roast chicken is a meal of supreme comfort and elegance. Today -- foggy, rainy, and overwhelmingly cool and clammy -- is the perfect day for a roast chicken. I love the elegant presentation, with a Frenched chicken leg. 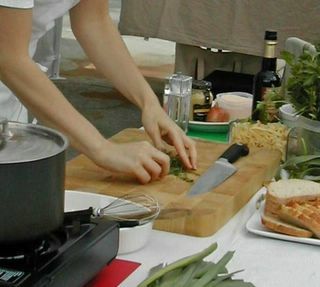 How I wish for some fresh herbs from the garden, but the market will have to do. And thank you for the idea of seasoning the chicken the day before; I've never tried that, but now I will -- it's almost like a dry brine, if there is such a thing! The Zuni Cafe cookbook also extols the virtue of salting the chicken a day or two before: so much easier than preparing a brine, and it really makes a difference! 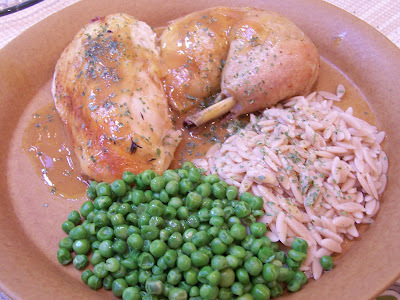 Love your descriptions of roast chicken, and I couldn't agree more; it's a meal of gorgeous simplicity. I believe Child used to exclaim that the chickens she tasted were so..."chickeny! 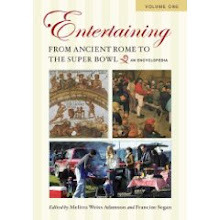 ", which is such a delightfully child-like and simple way of describing it. What greater compliment than saying a thing tastes of itself, which is to say the Platonic ideal of itself, what we imagine it ought to taste like. I'll be cooking roast chickens for the rest of my life. What gorgeous, simple yet delicious food. This looks so good and comforting. Heading back to Seattle in a few hours, I think I will be needing a recipe like this when I get home--though not in NYC today, it's like spring! My favorite part is all the fun things to do with the leftovers (if there are any). Nice write-up. Hi Lydia - hope you had an opportunity to brighten the day with some roast chicken! Louise - This was so easy, and the taste was wonderful - as Lydia says, it's a dry brine. Hi Veron - I may make Sunday a regular Roast Chicken tradition. I will have to look at the Zuni cafe book. Yes, "chickeny" is a great way to describe the dish! Blake - thanks for visiting! Didn't Julia have an amazing capacity to capture the essence of taste and smell in her language? I'm with you - there will be much more roast chicken in my life! Cakespy - travel safely! I hope there is roast chicken waiting at home in Seattle and that you have a good supply of Magnolia Cupcakes for the flight! Chou - Welcome and thanks for visiting! Sometimes the leftovers are even better. By the way, I went to your site and saw the picture of the solar house. I've visited that house at Champaign-Urbana. My cousin is the professor who advised the team on the creation of the house! 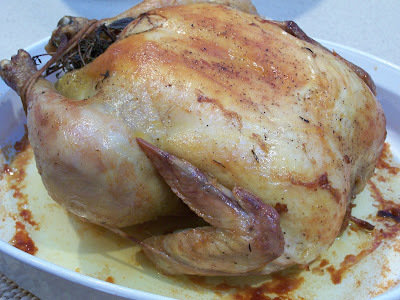 I wonder why so many rely on the supermarket roast chicken when it is easy to make a delicious roast bird at home. I guess it is the time factor. That is too bad, there is really no comparison. Sometimes the simplest things are the best. The picture of the fresh herbs inspire me to go outside and get started with my planting for this year. I think that's a great way to spend an afternoon, T.W. You know, growing up, my dad would freak when he found a bone in his chicken or fish. My mom, however, would seek out the bones and chew on 'em to no end! So many people buy those roasted chickens at the market nowadays (which I have never tasted), but they can't possibly be as moist and flavorful as a homemade one like yours. Hi Rochelle - Thanks for visiting! I have often looked at the rotisserie chickens, but have felt like I needed to master the roasting process myself. I'm glad I did! Kathy - I'm going to have to think about an herb garden this year. Hi Susan - I love the thoughts about your mom and dad! I am now getting obsessive about slow cooking, and now trying to come up with something else for this Sunday! That looks wonderful! Thanks for the great story behind this dish. Roasted chicken sure is comfort food! Jenn - Welcome and thanks! One of the best things about roast chicken is the many days of creative leftovers! Seems the real test of a cooks merit should their ability to DESCRIBE a roast chicken in a way that makes another person want to run out and roast their own. And on that front my dear, you must be the grandest chef of them all, because that description was the best I have ever read. Hands down. Wow. And yum!